Is your industrial marketing strategy relevant to the modern buyer? This collaborative eBook offers insights that will help you tackle the most pressing marketing and sales challenges faced by today's manufacturers. Inbound marketing’s impact on the manufacturing community is—without question—on the rise. And for good reason. Engineers and other industry target prospects and decision makers are online—and they do engage with your digital content. That's why it's critical that your business marketing strategy aligns with the needs of today's increasingly empowered buyers. 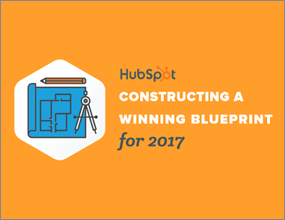 This collaborative eBook – Constructing a Winning Blueprint for 2017 – was specifically written for B2B manufacturers ready for change. With contributions from 23 unique HubSpot Agency Partners (including PMG, of course! ), each leveraging their experience working in the industrial sector, the content elaborates on how today's manufacturers can overcome the biggest marketing and sales challenges facing the industry in 2017. Tips for reporting and showcasing ROI... and more. Simply fill out the form to get the free eBook now!